South Sea Veneer was founded in 2002 as a subcontractor of wood veneer panel laminations for local customers. “Fast forward to present, we’ve developed our own line of furniture production and in-house collections,” revealed Alona Bituin-Sinsuat, the company’s Chief Operating Officer and design department head. Add to that, their subsequent expansion to include export. Alona is well-equipped for her twin roles, as the daughter of pioneering furniture exporters Jose and Myrna Bituin. Since she took over, Alona has expertly leveraged her company’s most valuable asset - the remarkable skills of South Sea Veneer’s workforce. 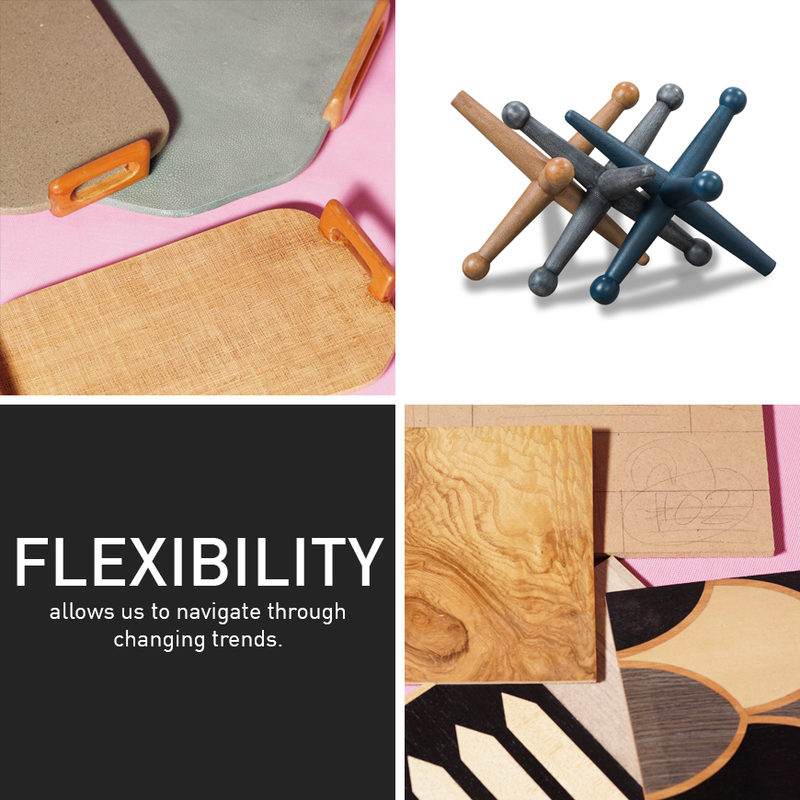 Clockwise from top left : Creo Trays with lahar-casted in resin; tabletop decor made from wood covered in faux shagreen; ash burl veneer and samples of marquetry works, alongside a draft of an inlay pattern. Chair and side table photo: Callista side tables made with ash wood veneer, and faux shagreen-covered top. The Santino side chair features a sunburst solihiya pattern set off by a simple wooden frame and torno (or turned) details on the legs. The inlays are added to modern, sleek frames to set off the delicate designs. This is revealed in the company’s catalogue featuring tables, cabinets, stools, trays and decorative boxes, among many others, decorated with the woodwork patterns. These products have found markets not just in the Philippines, but in foreign shores as well. South Sea Veneer’s furniture collections reveal its contemporary slant. Metron Drum side tables with maple and black-dyed wood veneer, split rattan inlay and faux shagreen top. Top photo: A sampling of South Sea Veneer’s different surface treatments and woodwork raw materials.